After a comfortable and hospitable flight on Iberia Airlines, I touched down at Madrid’s Barajas airport bright and early on Sunday morning. This isn’t my first time in Madrid, but I noticed right away the growth in the airport´s facilities that I don’t remember from my previous visits. After retrieving my luggage, I met our gracious hosts and the other fellows just outside of the baggage claim area. Right away, I could sense that this is a talented and special group of highly accomplished professionals. We proceeded to our hotel where we checked into our rooms awaiting a week full of opportunities to meet Spain’s cultural, business, and political leaders. Because I couldn’t just stay in my hotel room, I ventured out to roam the city’s streets shortly after check in. 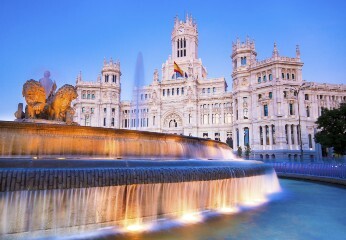 The weather today in Madrid is absolutely perfect. Sunny skies, cool temperatures, and families strolling around the city’s famed paseos. I stopped at a local cafe and eagerly ordered a cafe con leche with a pastry. I am highly anticipating what this week will bring. I am looking forward to getting to know my American colleagues as well as some of Spain’s treasures. Special thanks to the Carolina Foundation and the Spanish Embassy for making this program possible.